How Many Calories are in Chinese Chicken Balls? Wade Harle began writing professionally in 2011 and holds a bachelor's degree in journalism from Iowa State University. His work on sports and other topics has been published on various websites. 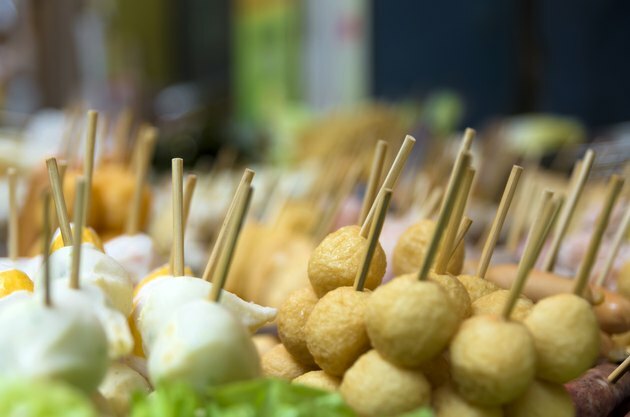 Chicken balls, usually made in sweet and sour sauce, are a common food in Chinese cuisine. They are typically breaded and deep fried, and can be high in calories. Two chicken balls in sweet and sour sauce have 162 calories and 5 g of protein. Additionally, the chicken balls have slightly more than two-thirds of the daily recommended vitamin C intake, according to the My Fitness Pal. Twelve deep-fried chicken balls without sweet and sour sauce can have up to 1,800 calories, according to Restaurant Confidential and the Center for Science in the Public Interest. The meal also can have 20 g of saturated fat and 2,700 mg of sodium. Eating four of these is the equivalent of a 10-piece McDonald's chicken McNuggets meal. Restaurant Confidential says some dishes at Chinese restaurants have high amounts of sodium as well as breading and batter. It recommends having foods stir-fried rather than deep-fried, and not adding salt.